The rare torpedo discovered by dolphins off the coast of California arrived safely at the Washington Navy Yard on May 30. 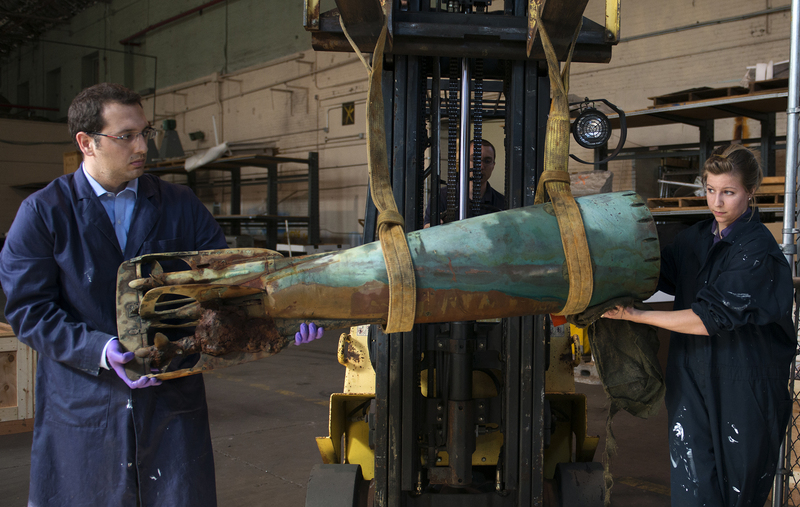 Naval History and Heritage Command’s Underwater Archaeology Branch now has the remains of the Howell torpedo, a Navy release said. It is only the third one known to exist; the other two are displayed at the Naval Undersea Museum and the Naval War College. Before arriving in D.C., the torpedo was placed in fresh water, which helps leech the salt out of the artifact, the release said. It’s a slow process. The release said it could take months to restore this artifact. Two dolphins trained by the Navy to detect mines discovered the inert torpedo during a training exercise. When the dolphins signaled a mine was present in an area the trainers didn’t expert, divers checked out the site and found the 100-plus-year-old inert torpedo. The Howell torpedo was the first torpedo that could be released into the ocean and follow a track, according to a Defense Department release. Only about 50 were made between 1870 and 1889.